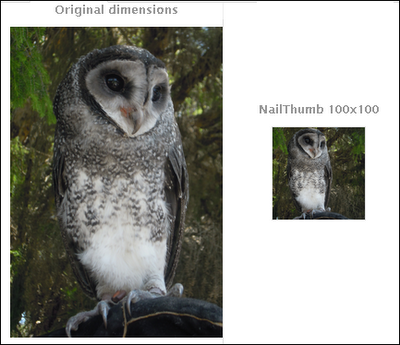 jQuery NailThumb is jQuery plugin allows to create thumbnail from any image with full control using jQuery. You can create thumbnails easily from high-resolution images, without any distortion, with one line of jQuery code. You can even decide thumbnail dimensions directly from CSS. Integrates prefectly with any media gallery, even more usefull in dynamic web application when you can face any shape or size. If you want to add avatars to your application it's easier to use this plugin to let them fit any size you need then to develop a functionality that help your user to upload avatars of the right size/sizes. This plugin provides various methods to create thumbnails. Whatever method you choose and whatever proportions limit you fix NailThumb will always create a thumbnail without any distortion and will keep your image as big as possible.